Mohr IP Law works with dynamic clients who have achieved success in a wide-range of industries. Some of our clients have been featured on Shark Tank, Gizmodo, Endgadget, and other national media outlets. Other clients have had great success crowd-funding their products on Kickstarter and IndieGoGo. Still other clients have been acquired by larger companies, including Fortune 500 companies and Silicon Valley tech companies. We have enjoyed seeing our clients get national exposure and have great success with their intellectual property. We take the opportunity to highlight some of our clients here. TurboPup is a client that has enjoyed excellent nationwide exposure and rapid success. TurboPup makes meal replacement bars for pets. Mohr IP Law has helped TurboPup with its U.S. and international patent and trademark matters. In 2015 and again in 2016, TurboPup was featured on the popular TV show Shark Tank. Kristina Guerrero, the founder of TurboPup, was able to secure a $100,000 deal with Shark Daymond John. 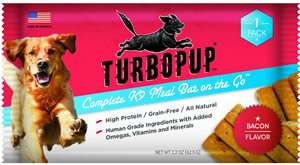 Since then, TurboPup has been picked up by major national distributors, such as PetsMart. TurboPup was originally based in La Pine, Oregon, and is now based in Vermont. TurboPup at Shark Tank Unable to load video.